Yesterday afternoon, somewhat obscured by the Fed’s media-savvy and endless flip-flopping about rate hikes, the Board of Governors of the Federal Reserve released its second quarter delinquencies and charge-off data for all commercial banks. It shows that if the Fed wanted to raise rates before serious signs of trouble emerged, it might have missed the train. Consumer loans are still doing well, though delinquencies have ticked up 10% from a year ago to $26.8 billion. Loans are considered “delinquent” when they’re 30 days or more past due. Credit card loans are also still doing well, though delinquencies have jumped 11% from a year ago to $13.8 billion. Delinquencies of all real estate loans are low and still falling. Which is logical: commercial and residential real estate prices have been soaring for years. If borrowers get in trouble, they might be able to refinance and cure the delinquency, a form of “extend and pretend.” Or they might be able to sell the property and pay off the loan. Delinquencies in real estate don’t rise until property values are falling. That is now happening in some cities, but it hasn’t yet budged the national averages. But delinquencies of Commercial & Industrial loans are a doozie. There are $2.06 trillion of these loans outstanding at banks in the US. In Q4 2014, delinquencies hit a post-Financial Crisis low of $11.7 billion. That’s when the largest credit bubble in US history peaked, or more politically correct, when the “credit cycle” began to end. Then delinquencies started to soar. Initially, this was due to the oil & gas bust and the numerous defaults that it triggered, but increasingly it’s due to trouble in other sectors, including retail. At the end of Q2, 2016, delinquencies hit $29.6 billion, up 150% from Q4 2014! 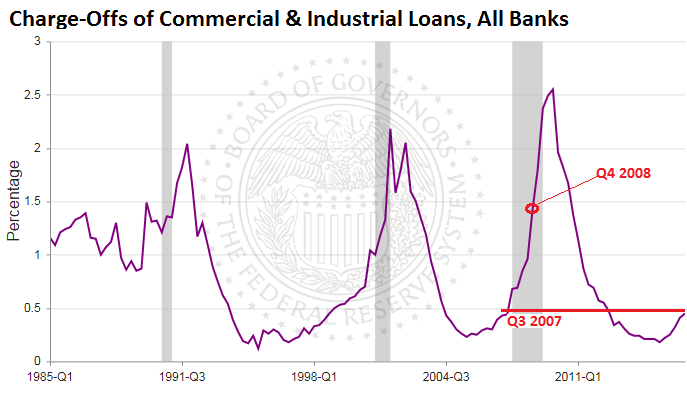 What’s even more significant than the absolute level of delinquencies in C&I loans is their unpleasant function as a leading indicator of big economic trouble. C&I delinquencies rise in the run-up of official recessions: sometimes with little lead-time, as during the Financial Crisis; other times with more lead-time, as during the 2001 recession. Companies load up on debt – egged on by their own optimism, eager loan officers, the Fed, and low interest rates. When business conditions aren’t quite as perfect as hoped, and when sales and cash flow, instead of skyrocketing as expected, are shrinking, these loans begin to weigh on the business. At that point, formerly eager loan officers begin to get nervous. With regulators breathing down their necks and asking questions, they put one hand on the money spigot. And suddenly, a company has trouble scraping up enough cash. Payroll comes first. There are other priorities too. So the executives sit down with their bankers and try to work something out. That’s how it starts for smaller businesses. It’s not the end of the world for a company, but it’s the beginning of big trouble. Large companies have other options. They can sell junk bonds to yield-desperate investors and pay off the bank loans with the proceeds. This works – until it doesn’t. If the delinquency is not cured within a specified time, the bank gets serious. It goes after the collateral and charges off the portion of the loan balance that it deems uncollectible. That charge-off rate has started to rise. In Q2, it reached 0.45% of all C&I loans. Last time it rose to this level was in the run-up to the Financial Crisis: it hit 0.44% in Q3 2007 and blew to 0.68% in Q4 2007. Even during the darkest days of the Financial Crisis, with banks toppling and getting bailed out, the charge-off rate maxed out 2.55%. It doesn’t seem like much. But it doesn’t take that much to sink the banks! When companies see a squeeze on the horizon, they re-prioritize. To conserve cash and be able to service their debts, they cut costs and capital expenditures. Often this isn’t enough. Delinquencies become a reality. More cuts are made, which then impact sales, which begin to fall more sharply. These cuts in costs turn into lost sales for suppliers, which then have to undertake their own cuts. It spirals through the system. If enough companies do this, and if they lay off enough people, it filters down to the consumer. By that time, big trouble is appearing in other data. 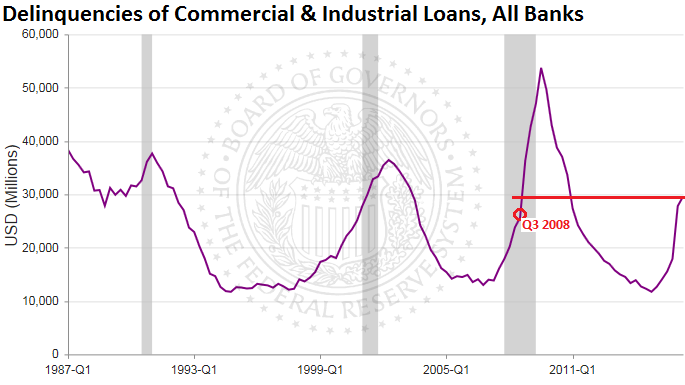 Hence the tight relationship between delinquencies of C&I loans and recessions.